Dawn of the Classic Era, 1982-83. By the release of Piece Of Mind in 1983 the band had found their ultimate line-up and the world was theirs for the taking. But what would the classic era of Iron Maiden have been without the twin guitars that are so essential to the band’s sound? With the vinyl and digital reissues of Powerslave (1984) and Live After Death (1985) in recent years, the joint pinnacle of Maiden’s classic era, it’s time to celebrate the most iconic of guitar partnerships: Dave Murray and Adrian Smith, the axe team that really made the 1980s rock. Adrian Smith and Dave Murray, making the 80s glove…glow…rock! 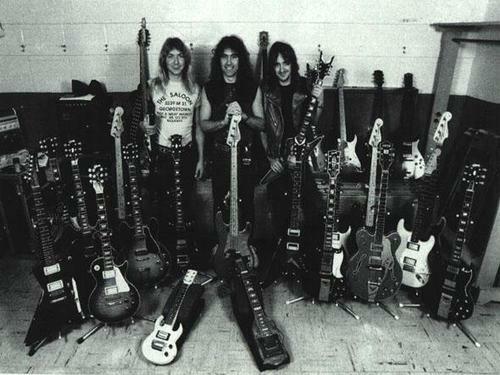 Dave Murray was always Steve Harris’ first choice as lead guitarist, ever since the Maiden chief first heard him play. Whatever happened – Murray as the only guitarist, Murray partnered with one or even two others, Murray being fired from the band by singer Dennis Wilcock – Harris knew he wanted the blond guitarist in his band. Period. In the end the bassist started building Iron Maiden around Murray and drummer Doug Sampson, before getting singer Paul Di’Anno in and establishing what we know these days as the early Iron Maiden sound. But Maiden were always about twin guitars. It was one of the founding principles of Harris’ new band, to craft a sound inspired by the twin leads and harmonies of bands like Wishbone Ash and Thin Lizzy. A host of short-lived Maiden line-ups followed, as the band searched for a second guitar player. As they got closer to recording their first album in late 1979, it became important to get the position filled. At this point, the inevitable happened – they asked Adrian Smith to join. Old friends Smith and Murray were destined to be in a big band together, even if Smith turned down the initial offer from Iron Maiden in late 1979. Here they are on the World Piece Tour in 1983. He eventually declined, something Harris understood perfectly. “I suppose it was a bit like me with Maiden,” said the bassist. “It was his band, and he rightly wanted to stick with it and see if he could make it happen.” But Urchin fell apart soon after, while Maiden got Dennis Stratton in the band for their debut album Iron Maiden (1980). Without a band, and without a job, Smith tried his hand at professional songwriting in late 1980 when he teamed up with a songwriter from the West End. It did not work at all, and Smith felt even worse about things. Depression was setting in. Walking home in the rain, Smith bumped into Harris and Murray in the street. Yes, literally. Like he says, “It was like something out of one of those really corny old films.” At that point Maiden had fired Stratton, the reasons for which are outlined in this previous article. Maiden needed a new guitar player. Fate turns Adrian Smith’s life around, and he finally teams up with his ultimate guitar companion, Dave Murray. By 1984, Maiden’s classic line-up would be well established, l-r: McBrain, Harris, Dickinson, Murray, Smith. Smith was asked to audition for Maiden in London in late 1980, a request that surprised him a little since he thought Murray knew more about his guitar playing than Smith did himself. The audition went well and everyone got along great. Manager Rod Smallwood was suspicious though, and kept interrogating the guitarist to make sure he could play both riffs and leads. Smith went to a nearby pub with the tour manager to wait for the band’s decision. Smith was in. And Iron Maiden went to work on their second album, Killers (1981), which saw the beginning of the Murray/Smith partnership that would not only be essential to Maiden’s development, but extremely influential to the sound of heavy metal throughout the 1980s. The classic Iron Maiden sound was actually created as early as Killers, in no small part thanks to producer Martin Birch and the welcome addition of Adrian Smith to the line-up. In the following years Maiden grew into their classic era proper, with the release of The Number Of The Beast (1982) and Piece Of Mind (1983). The Murray/Smith partnership blossomed as Maiden conquered the world. Smith would not only be one half of the Maiden guitar team, he would also emerge as one of the three most important songwriters in the band. Harris’ metal anthems and epics would always be the backbone of the Maiden records, but singer Bruce Dickinson quickly joined in the fun with proggy masterpieces like Revelations and Powerslave. With Murray rarely writing, and drummer Nicko McBrain not writing at all, Smith became the “other voice”, churning out more accessible rockers like The Prisoner, Flight Of Icarus, and 2 Minutes To Midnight, co-writing with either Harris or Dickinson. By early 1983, as Maiden were writing Piece Of Mind on the island of Jersey, Smith’s writing partnership with Dickinson came into full bloom. The timeless metal classics that would burst forth from the combination of these gentlemen’s creative energy are still blowing minds, more than 30 years later. The tour was a resounding success that laid the groundwork for what was to come. 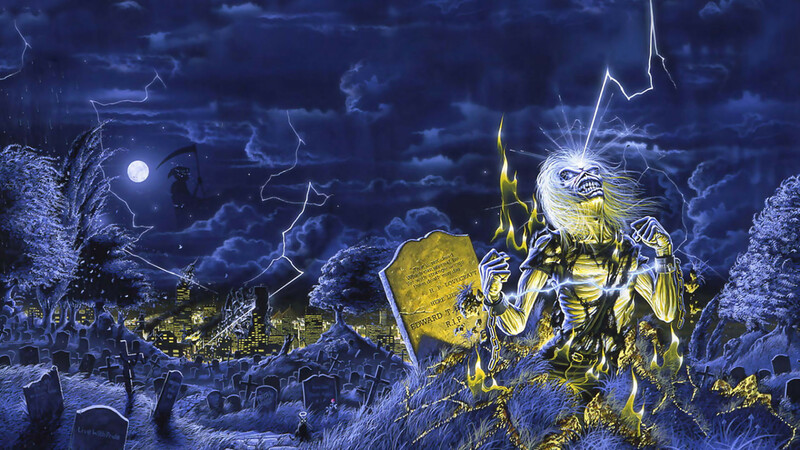 Maiden’s classic era had truly arrived, and the next album project was vitally important. Putting Powerslave (1984) on even today, one is struck by the guitar work on display. From the harmony guitars that open Aces High, through the delicate and groovy riffing of The Duellists, to the otherwordly chords and solos of the title track’s middle section… This is guitar playing to reference. Without the pairing of Murray and Smith, it’s doubtful if Iron Maiden would have become what they are. Quite simply, planets aligned. Click here for our retro review of Powerslave! Smith contributes two songs to the album, first single 2 Minutes To Midnight and the less appreciated Back In The Village, both written with Dickinson. Murray on the other hand doesn’t contribute a single song, keeping up his average of one song every other album. But credits aside, it’s the guitar work that steals the show on the Powerslave album. The Derek Riggs-inspired inner sleeve for the Powerslave album has a serious mystique about it. Murray and Smith, flanking the others, would provide the audio counterpart through their guitar work on the album. Recording at Compass Point in the Bahamas, Maiden were once again produced by the great Martin Birch, who had no small amount of guitar experience from his work with bands like Deep Purple and Black Sabbath. The album’s sound is very guitar-oriented, and the band indulges in guitar overdubs that still doesn’t distract from the live aesthetic that had become so important to Maiden. The sound of Powerslave is the sound of a band who is completely at ease with their own style and direction. One of the clearest signs of Maiden’s self-confident stride into territory all their own is the guitar playing of Murray and Smith. There are three-part harmonies audible on tracks like Aces High, The Duellists, and Dickinson’s awesome Powerslave, as well as plenty of layered rhythms and harmonies in parts of 2 Minutes To Midnight and the phenomenal 13 minute Rime Of The Ancient Mariner. The latter is also a prime example of the guitar duo’s ability to weave soundscapes without riffs, leads or power chords. The eerie middle section transports the listener through space and time as the guitars conjure up images of foggy seas and creaking ships. Maiden’s guitar work had never been as sophisticated. The band would rely heavily on the guitarists’ atmospheric abilities as well as their flawless lead work when crafting the subseqent Iron Maiden studio record, as this retro review argues. But the partnership was really bearing fruits at the time of Powerslave. When the band launched their biggest ever tour in 1984, Maiden’s classic era was at its peak, both commercially and artistically. The World Slavery Tour awed audiences worldwide in 1984-85. Dubbed the World Slavery Tour, Maiden’s global assault started behind the Iron Curtain in Eastern Europe, a first for any band of their size, and continued through Europe in August to November 1984. Then Maiden did their biggest ever tour of North America, stretching from November 1984 through March 1985, only interrupted by a trip to Brazil in January for Rock in Rio. April and early May saw visits to Japan and Australia, before the tour ended with another US leg in May to July. Phew! At the end of the trek the band was spent. It was time for their first real break from touring and recording. The break from activity would still see, well, activity. In 1985 Iron Maiden finally released their first live album. In retrospect, it seems strange that the band didn’t release the brilliant March 1982 recording of their London show. It was only intended as a video release (which didn’t happen either), but it still sounds awesome more than 30 years later. In 2004 this recording also surfaced on the Early Days DVD set. But back in the classic era, this monster of a performance was not to become the first Iron Maiden live album. It was a different time, when such recordings was a very rare occurrence, unlike the one-live-album-per-tour routine of today. The 1983 Piece Of Mind tour also passed without an official live document, but with the highly anticipated Powerslave release and world tour Maiden and Rod realized the time was right, maybe even overdue. Martin Birch was hired to record 4 nights at Hammersmith in London early in the tour, October 1984, and another 4 nights at California’s Long Beach Arena in March 1985. The result was the double Live After Death (1985) album. Ouch, our eyes! Maiden in 1984, scaring people off with their ludicrous striped shirts and a checkboard-bass. Click here for our retro review of Live After Death! A much more thrilling characteristic of Live After Death is the sound of Murray and Smith. By this point, they have truly become the greatest guitar partnership of the 1980s, maybe of all time. Their interplay is effortless throughout the album. From opening duo Aces High and 2 Minutes To Midnight off the Powerslave album, everything sounds tight and confident. Riffs pulsate, harmonies soar, and leads are traded off like it’s the simple matter of buttering bread. The tracklist of the band’s first live record focuses heavily on the three latest studio albums. Indeed, the North American set that makes up the bulk of the record had no songs from Killers and only two from Iron Maiden. Wrathchild and Phantom Of The Opera appear because of their inclusion in the European setlist. There is no mistaking what the classic era Iron Maiden have become – the world’s biggest metal band due to the tripple whammy of The Number Of The Beast, Piece Of Mind and Powerslave. With master bass player Harris leading the charge, the ever-reliable drummer McBrain in the engine room, singer Dickinson fronting them with bravado, and the inimitable guitar duo of Murray and Smith giving them wings. End of the Classic Era part 1, 1986-87. Sources: Run To The Hills – The Authorised Biography (Mick Wall, 2001), The History of Iron Maiden, part 1: The Early Days (DVD, 2004), The History of Iron Maiden, part 2: Live After Death (DVD, 2008), What Does This Button Do? (Bruce Dickinson, 2017). ← TOUR UPDATE: Maiden Slovakia!